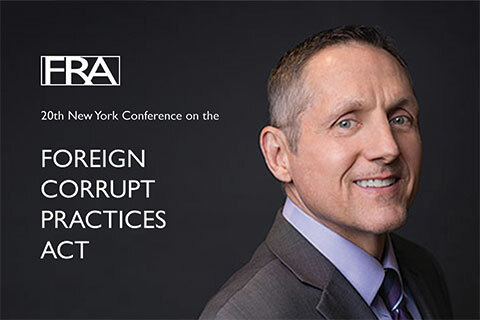 FRA’s Mark Gonzalez, Director of Business Development in FRA’s Washington DC office, attended the 20th Anniversary New York Conference on the Foreign Corrupt Practices Act. The 2018 program was highlighted by Deputy Attorney General Rod Rosenstein’s keynote. Well-covered by many of those reporting on Mr. Rosenstein’s speech was his announcement of a new policy to “discourage disproportionate enforcement of laws by multiple authorities.” In essence, “piling on” will not be tolerated. The program from this year’s event covered topics including the new corporate enforcement policy in practice, data analytics in practice, third party compliance benchmarking, defending your FCPA compliance program to the agencies and “operationalizing” your global compliance program. Companies weighing self-disclosure should act promptly, take a posture of full cooperation and demonstrate a commitment to remediation, including tone at the top review and compliance program scrutiny. Data analytics – the power to mine information across disparate corporate repositories is the quintessential strategic tool for managing risk throughout the enterprise. Resulting insights can be key indicators of risk ‘hot zones’ within the organization. Leading benchmarks for third party compliance includes full engagement with business units, programs become living entities and enterprise systems interoperability. Combined, these facets make for a sparkling example when managing the risks associated with engaging third parties. Interviews with CLO’s reveal consistencies across widely varying industries: Financial Services vis-à-vis Food & Beverage. Hyper-vigilance within the risk mitigation function is required across four areas: governance, systems, compliance/testing and people. When “operationalizing” your global compliance program, pay keen attention to the human emotion of ‘pride’. A proud individual tends to be more competitive; in turn, competition can play an instrumental role in the creation and sustainability of a culture of compliance.